If you're a nail polish fanatic, you'll no doubt have heard of all-indie polish boxes such as A Box, Indied (US) and What's Indie Box (AUS) which are monthly boxes filled with exclusive indie polishes from a number of different makers. 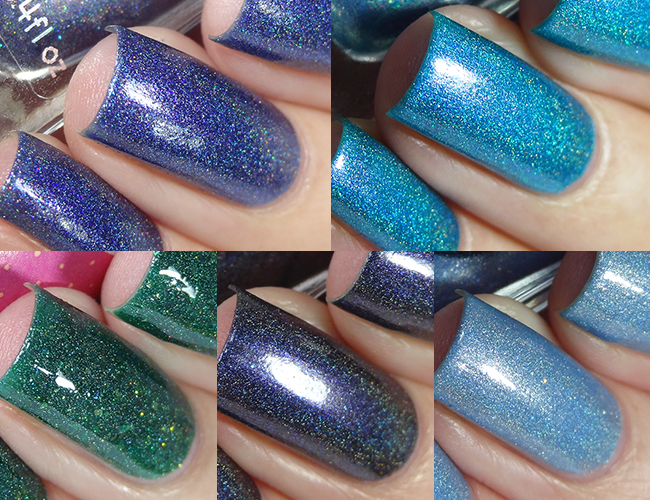 Well, now the UK has it's very own box called Paint The Rainbow, from the people behind Rainbow Connection, and I have the September box to show you today. 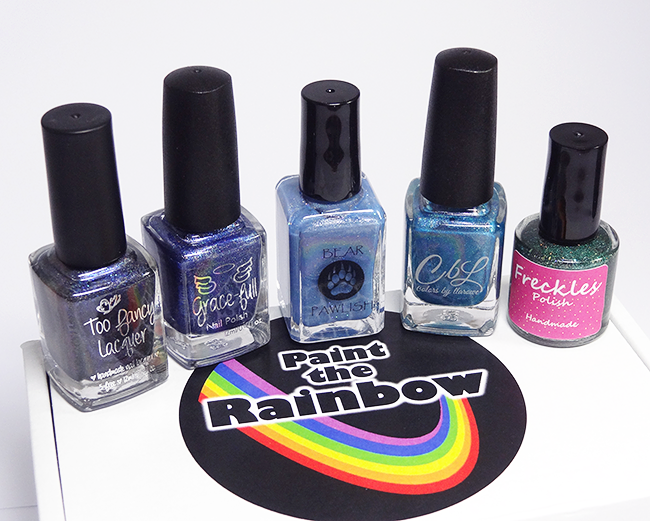 In each Paint The Rainbow box you'll receive 5 full sized, specially created polishes plus a bonus item (bonus items so far have been nail vinyls and a cuticle oil) and each month there's a new theme. 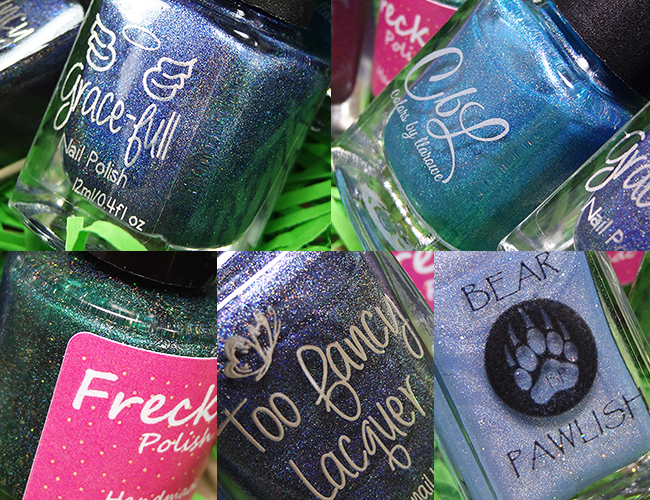 The theme for September's box is Children's Books and features polishes by Too Fancy Lacquer, Grace-full, Bear Pawlish, Colors By Llarowe and Freckles Polish. Here's a "by accident" shot, which I ended up liking more than the other swatches...typical. 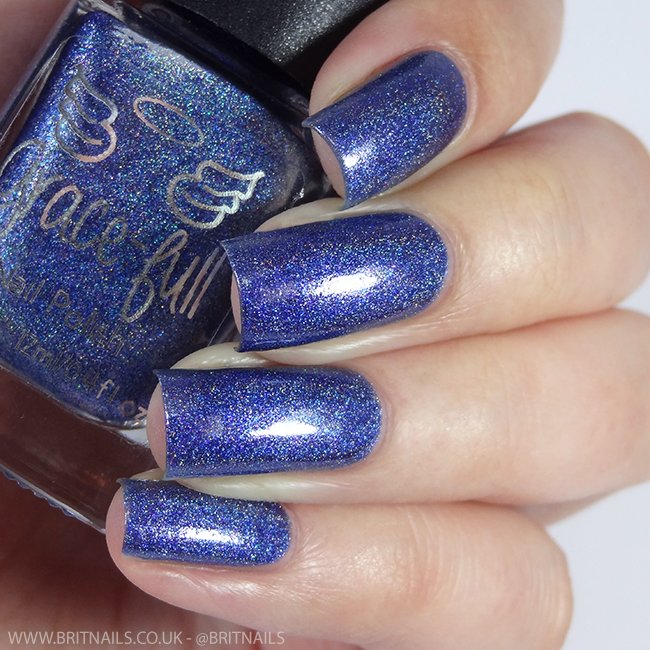 The Pigeon by Bear Pawlish is an icy blue holo with larger holographic sparkle. This is a little more sheer than the others, I used 3 thick coats plus top coat. I love the fact us UK girls (and boys) now have the option of an indie box without having to pay for expensive international postage, and having UK indie makers on board makes it that extra bit special. Have you ever bought an all-indie polish box? Let me know your thoughts! - Paint The Rainbow boxes are available from Rainbow Connection, and you can still pick up a September box. October's box will be available soon. What a beautiful box and I love the idea of making a theme each month. It also seems like a great value for money for such an awesome box packed with goodies. That beautiful green looks perfect on you. Loved your swatches and the whole post. But I was a teeny tiny baffled at how a box called Paint the Rainbow had so little colour variety :( So many blues - don't get me wrong, they're gorgeous and I get the theme idea, but... so little variety still. This box is so awesome!! I understand Mina's point, if you're not into blues or greens this box isn't for you but I personally quite like the shade selection. Your swatches show these off so beautifully. A box full of blues and greens is a winner in my book! Plus your swatches are perfection. I can't wait to see what the other months will be! Thank you! :) I think there'll be wider selections in future, just so happened that the makers all went for a similar colour scheme for this one! There are always sneak peaks before it goes on general sale so you can get a good idea of the polishes you'll be getting. I really love that about this box. Annette is great at keeping you salivating!